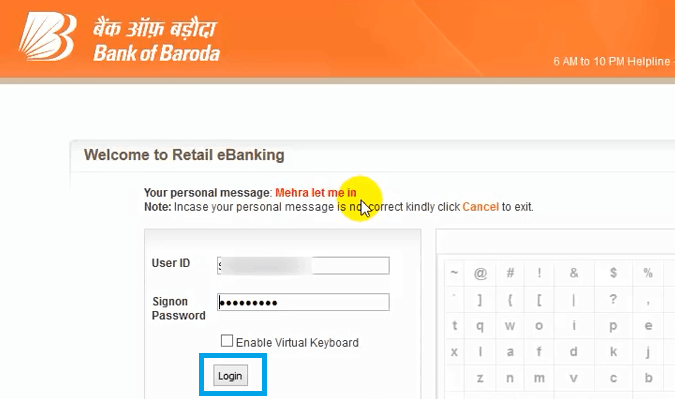 After completing Bank of Baroda net banking registration process, you have received your User Id through email or on your registered mobile number and also received sign on password and transaction password from Bank Of Baroda branch. But, you are little worried about the process of first time login to BOB Internet banking then this article is for you. Here we are going to discuss the various steps to get you know how to login first time in Bank Of Baroda internet banking successfully. Step 2: Scroll down a bit and go to login section. Press 'Retail User' if you are individual or 'Corporate User' if it is corporate account. Step 3: A new window will open. Write your User Id at the first empty box, just adjacent to the text 'User Id' and press 'Enter' tab. Step 4: This will open up a new page. Now you have to enter the 'user id' and 'Sign On password'. Remember that the password is case sensitive. Step 5: Bank of Baroda secure enrollment page will open up. 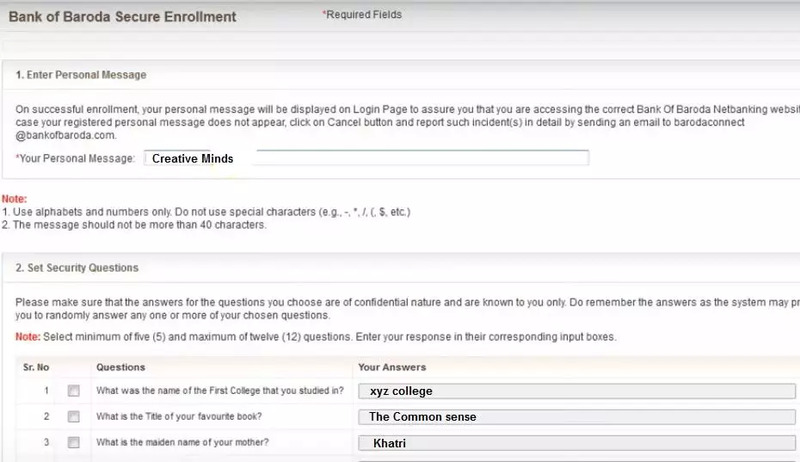 Click on 'Enroll Now' to proceed. In the first section, write your personal message that will help you identify the correct bank url in future. Now 'Set security question'. There are about 16 questions. Select any five at least and write the answers to the adjacent empty boxes given respectively. The third section is 'Set Password'. Input your sign on password at the first empty box in this section, just adjacent to the text "Existing Sign On Password". Enter your new customized password at the second empty box in this section, just adjacent to the text "New Sign-On Password". Now re-enter the new sign on password on the third empty box, just adjacent to the text "Confirm Sign-On password". Now enter your transaction password in the fourth empty box, just adjacent to the text "Existing Transaction Password". Once you are done with filling up all the details click on "Submit" tab. Step 7: In the next page, you have to create your new transaction password by filling up details such as existing transaction password, new transaction password and confirm transaction password. Now click on 'Submit' to complete the process. Step 8: A pop-up window will come with the message stating that you have successfully created your new sign on and transaction passwords. Now click 'ok' and login to your Internet banking with the new credentials by clicking on 'retail' link. Step 9: Now enter the mobile number registered with Bank of baroda saving account and click the 'submit for receiving otp'. Step 10: Next enter 'otp' sent to your register mobile number and click the 'submit' button. 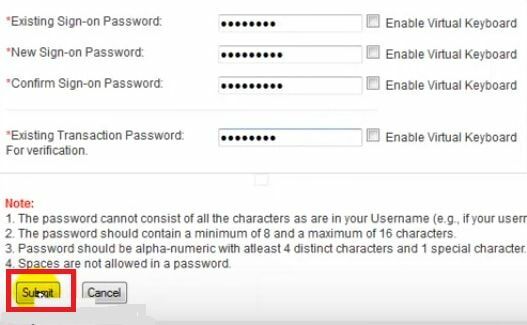 Step 11: Now again login your bob net banking account by entering user id and password. Now accept the bank of Baroda Terms and Conditions by clicking on 'Agree' button located on bottom of that page. Step 10: Last time, enter user id and password, and enjoy online banking with Bank Of Baroda. Now you can add beneficiary and initiate fund transfer in bob net banking. Hope this article has helped you in logging first time in Bank Of Baroda internet banking. Leave comment if you have faced any issue we will try to solve it. How to Get Kit Number in SBI Online Banking?